We all know the manly archetype: the cool, calm cowboy, hat pulled low, hand resting on his holster, with one eye on his horse and the other on his woman. It's one of the more romantic images of the tough, red-blooded American male ... and also one on the verge of extinction. So says author Guy Garcia in his new book The Decline of Men: How the American Male Is Tuning Out, Giving Up and Flipping Off His Future. Procrastination Twitter led me to this Ad Age interview, where Garcia discusses his book's main themes. Among them: women's increasing competence (and numbers), lack of strong masculine examples in media and society, and the need for a new kind of man. The new kind of man will take many shapes and forms. That's what's new about him. We know that the old, rigid definitions of manliness are outdated and dysfunctional. Men can no longer hammer women -- or the world, or each other -- into submission without ramifications. That game is over. It's time for us to resurrect the masculine virtues that are much older than modern society: compassion, generosity, loyalty, modesty, humility, farsightedness, curiosity and patience. [...] There's one more: courage, as in the courage to change; the courage to be different and not apologize for it; the courage to care about a stranger or cause that does not directly benefit you. And don't forget the courage to frankly admit and talk about the decline of men. Um, call me idealistic, but isn't he describing traits that define any solid, productive, well-adjusted person? Last time I checked, compassion/generosity/etc. weren't masculine values -- they were human values. As such, I think Garcia's points are a little overblown. What he terms as a disaster route to extinction, I see as growing pains. Yes, men's roles are changing in society. But they're not necessarily changing for the worse. What's happened is that the masculine stereotypes (good and bad) Garcia cites in the interview have come back to bite the gender. Their long-cherished structures no longer allow for individuality or flexibility -- exactly the traits what women fought for in their equal rights struggles. Indeed, look at what women achieved with the feminist movement, based on the belief that women could do anything they wanted beyond stereotypical gender roles. It wasn't that they HAD to do everything that men did, or do it better. Rather, they worked to have every option available to them, and then enjoyed the freedom to pursue what best fulfilled their personal humanity. Now, men have to work toward that same destiny. This might lead some of you to think I'm advocating a masculinism movement. I'm not. Women were unequal for centuries; men have felt like they're in decline for at most the last 60 years. The reaction must be proportional to the action. So a revolution isn't needed. Acceptance is. Acceptance that men are as free as they ever were. Acceptance that opportunity for growth sits squarely in their own hands. Acceptance that the media is a reflection of society, not a driver, so the onus is on men to become the role models they seek. And acceptance that it will all take time, energy, and initiative. I have a progressive father, a Millennial brother, two male roommates, and scores of other compassionate, generous, kind, courageous men among my friends and relatives. They are examples of all that men -- indeed, people -- can be. So when I look at them, I don't see the decline of the American male. I see the rise of a stronger, balanced, understanding society. And if the rest of American men follow their lead, we should prepare for a much more positive interpretation of the phrase "be a man." I love reading your blog posts in general, but this is one of the best one's you've written. I believe that recent times have led to a more complete society - one that doesn't adhere to rigid rules of roles, no matter what those roles were/are. Instead, we have people pursuing equally their goals in life. Perhaps the biggest problem is that male role models are often the sports personalities who, in many cases, should not be role models at all. If there's a change that should be made, we should be equally setting up role models of both genders throughout all fields. 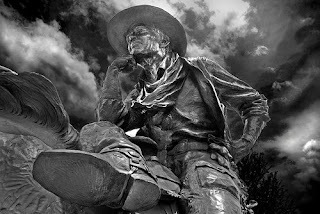 Just as the role model for women has shifted from the Donna Reed caricature of the 50s to the strong, independent leaders of today, the male role model needs to shift from the John Wayne caricature of the 40s and 50s and the sports personalities of more recent times to the strong, independent leaders in these fields. I think what people refuse to acknowledge about the women's movement is the point you make: while the movement started out trying to bring equality to women, what it's actually done is created a more level playing field for everyone. Men are restricted by outmoded gender roles just as much as women are and the movement has given them the freedom to redefine their role. One other thought: Garcia neglects to mention that women are still struggling with our new(er) gender roles. (fake) Mommy wars anyone?? Lyndon Johnson's Great Society was a great factor in man's loss of dignity, prestige and roll model. When funds were provided for the sopport of children where there was no father in the home, many men left the home. Illegitimicy bacame a big factor. Today in some social groups 70% of births are out of wedlock. Offspring from these broken homes are also very much involved in drugs, crime and are the major group in prison. The lack of a male roll model is generally considered to be a major factor. In support of what I am writing, there was a picture in the local paper of four generations, all female. The youngest was 3 years old, her mother was 12, her mother was in her twenties and the great grandmother was in her forties. Now it will be very hard for boys growing up in these families to develop verygood self images. My daughter, who is a school teacher, along with her peers,is trying to encourage them. In society in general we are seeing how seroius this downfall of man is by the fact that so many of them who recently have been chose for high political have lacked the moral character to serve. However, I believe there is hope. I see so many young families nowadays where every one is fulfilling their roll and happy, beautiful,bright children are being reared. I do wonder sometimes if women are a bit schizophrenic about what they want men to be. The cynic in me suggests that women want a "modern man" when it's convenient to have an equal and a "man's man" when it's convenient to be taken care of. Of course, one could argue that some men are looking for the perfect woman who's a balance of maternal nurturer vs. strong, independent, fun girl-pal, so I guess it all depends on one's perspective. Axiom 1 is that guys don't change their fundamental character, no matter how much one might like the challenge of reforming a lovable rogue into Mr. Domestic. Second, most guys are probably a couple points down on the spectrum from where they appear at first glance (when they're on their best behavior). I.E. a dude who seems "too nice/polite/deferential" might be "just right" and what appears to be "just right/nice-guy-with-an-edge" at first may seem kinda jerky over time as things settle down. I realize that this isn't exactly the kind of thing that the original post was talking about, but it did get me thinking about the subject in a very general way. MF: Ooooh, the interesting points you raise! You've inspired me to cover these in another post (or several) later. Stay tuned -- I'll hope you'll chime in again, because as my friend Sara puts it, gender discussions like these "never get old and never get anywhere"!! 1. Where I have been most disturbed about the definition of men is among Roman Catholic men's groups. When a group of men get together in a church, whether in a singing group or a retreat, there are prayers and planned discussions about our "role as men." This is so coded that it could be in Latin. However, like the pre-Vatican II Mass when I was an altar server, I can translate: This is about "BEING IN CHARGE!" Such discussion are rarely accompanied by truly loving talk about wives, daughters or sisters as partners, helpmates or just plain equal. It is invariably about how we "abdicated our role as men." (i.e., how we stopped bossing our woman around, treated them as equals, and removed our gonads in the process). How sad. By the way, I am unlikely to attend any more organized R.C. events anymore due to this misogyny. I'm confident that Jesus would not have accepted such attitudes either. So "real men" do not have time to be reading or writing blogs? My, what a narrow definition of a man, pal. Also, you are so threatened by a single woman that you won't allow her to even discuss the state of manhood? I would like to see the woman who would lower herself to be with you. I'd venture to say that she's dumb, because I'm sure you like them that way. By the way, Pally, it did not escape me that you don't even have the guts to sign your name to your idiotic rants. Probably because you are obviously such a p*ssy! 1. Yes, comments were meant to be satirical, but as with all humor, it is often based in truth. 2. I am not threatened by a single woman. I was merely making the observation that for someone so well versed and knowledgable about what real men are made of, why she has not yet been successful in finding one. OK, so "real men" do not have time to be reading or writing blogs. But, ummm, didn't you just post a response on this blog? Which means, presumably, that you read the original post? Or am I missing something?